Los Angeles, CA — Today, Society for the Prevention of Cruelty to Animals Los Angeles (spcaLA) announced a way for animal shelters to help break the cycle of domestic violence and animal abuse: the spcaLA Animal Safety Net (ASN)™ program. For the first time since the program’s inception in 1998, ASN is offered to humane organizations, prosecuting attorneys, and domestic violence professionals as a free, downloadable manual. 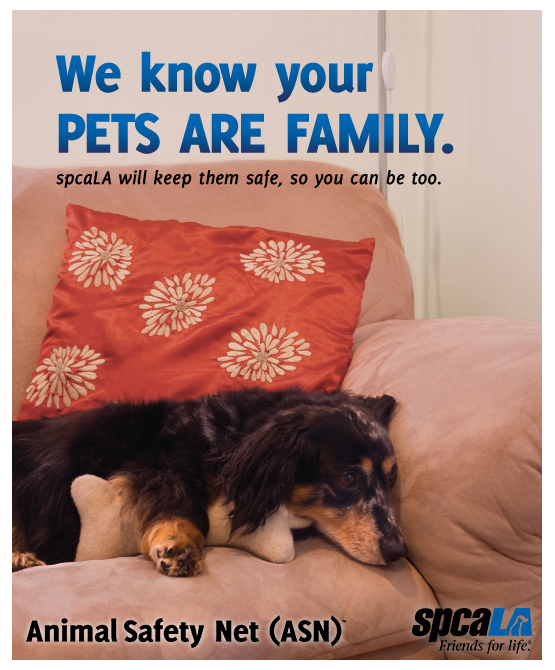 In the late 90s, after a rash of domestic violence episodes involving pets, including a murder-suicide that left a child and a cat in its wake, spcaLA President Madeline Bernstein saw a way for spcaLA to help. “Domestic violence survivors are reluctant to leave their abusers if it means leaving a pet behind,” said Bernstein. “And, typically, domestic violence shelters don’t allow clients to bring their pets.” Bernstein created spcaLA’s ASN program to provide two solutions: a way to help survivors of domestic violence keep their pets and leave their abusers. Since 1998, ASN has assisted more than 300 families and 500 pets, including dogs, cats, hamsters, and rabbits. ASN provides veterinary care, nourishing food, behavioral enrichment, and temporary safe shelter to animals in the program. The link between domestic violence, animal abuse, and child abuse is well-documented. In fact, 62% of ASN clients reported they would not have gone into a DV shelter, had they not been able to place their animal with spcaLA. They had good reason to fear for their pets’ safety; clients reported 23% of ASN pets had already suffered violence at the hands of their abusers. Knowing that their animal was safe and that reunification was possible helps survivors make it through a difficult time. Available as a download, the spcaLA Animal Safety Net (ASN)™ manual has what an organization needs to start their own ASN program. ASN has been making a difference in the Los Angeles community for nearly 20 years due to donations from individuals, foundations, and corporations. In fact, ASN was seeded by a grant from just one foundation. It is not government funded, nor is there a national spca or humane society that provides support. 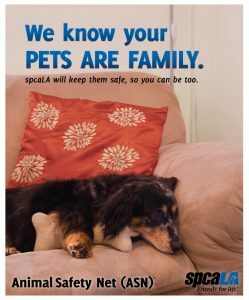 spcaLA is dedicated to the prevention of cruelty to animals through Education, Law Enforcement, Intervention, and Advocacy.